REELRADIO - The Mike Miles Collection! 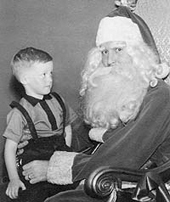 It was in the early 50s when Mike Miles (left) asked Santa (right) for his first set of walkie talkies. Mike writes, "That was back when communication between people was of the wired variety with bulky black phones. I remember that Christmas, listening to "other" people on the same frequency. Little did I know that I was infected with radio fever from that point on." "By middle school I'd built my first AM transmitter using a pair of tubes. It was exciting just to think that someone might be listening to me and the songs I would play from my 3 1/2" reel to reel tape player. I'd beg my sisters to change the tapes as I rode by bike around the block testing the reception. The excitement of hearing my "radio station" was incredibleknowing that the radio waves were traveling magically through the streets of Salt Lake City. One day I found an inexpensive wireless FM mic that I figured I'd mess around with and try to improve the transmission range. It occurred to me that I could simply put the entire mic up on a tall pole, running power and audio up to it, and I'd be in business. Now we were talking, my range jumped to blocks. Of course, I never realized the whole thing was illegal. The time finally came when I left home and ventured out. Junior college in California provided me an opportunity to work at KFJC. Licensed to Foothill Junior College in the bay area, KFJC was the "Dead Head" station. Working midnight to six, I remember the program director telling me to play lots of Grateful Dead music. Spinning the longest cuts I could find, I fell fast asleep. Waking to the skipping of the needle on the last groove, a caller told me that the music playing was cool. Yeah sure! Time and lack of money brought me back to Utah and school. KUER, the NPR station for the Salt Lake area provided me with an internship while I studied communication at the University of Utah. I worked as an announcer for classical and jazz music and music director. After graduation, I got a job in television production, audio, and finally management for KUED PBS television in Salt Lake City. While traveling for KUED as a location audio engineer, I'd record FM stations wherever we'd travel in the United States. I never did own my own radio station. Different paths took me in different directions. Still, radio is where my heart is. Just to hear an AM station fading in and out as the ionosphere filters its audio frequencies makes me shiver. I wonder late at night if the DJs feel the same excitement as their voices travel past the cities, sometimes thousands of miles across the land to my radio." The Repository thanks Mike Miles for sharing!
. . . I was going to give the weather forecast, but there isn't one . . . Otherwise, this is a cool wannabe original local radio station that was drawing from the fringes of everything most of us knew about radio in 1973. Why not present Top 40 music like an album rock station with jingles? Here we have the PAMS SOLID ROCK series (ie: WLS) used on a station with a female-focused Top 40 playlist (VARIETY, not diversity). They play 3-record sets (were they themed?) and the jock backsells each set. Then they play lots of spots with jingles between a couple of them. Notice how ONLY the newsman refers to the station as Crisp.
. . . Filling A Void, 24 Hours A Day . . .
And here's more rare Salt Lake radio with this hour of smooth-talkin' Dave Foxx on K-96, KAYK AM-FM/Provo Salt Lake City from June 9, 1976. Yes, it's stereo, but there's really nothing over 10Khz. "Stereo" and "hi-fidelity" are not necessarily the same thing, and this exhibit is a good example. There were lots of misaligned carts at the radio station, and fading on the mobile cassette recording side, mostly near the end. One song was restored at cassette flip. Dave is playing a young adult list, all familiar, with a decided preference for 25-49 females. The station had been previously known as KFMC, a mostly automated "old music" format, and there is even a Sound-Off segment featuring a letter from an angry ex-listener who doesn't like the new "MusicRadio" format! Check out that very casual newscast, during which Dave offers a special update from The Mormon Church. And is that Dave on the promos and "imagers", too? It almost sounds like a one-man radio station!
. . . I just wanna kiss you all over, stroke you with peacock feathers, rub cream cheese on my elbows . . .
Ron Castro is featured in morning drive on KIOI-FM and KIQI  K101 in San Francisco, on September 7, 1978. Castro started his radio career in Levittown, PA in 1966. He did mornings at both K101 and KSAN in San Francisco. As of 2013, he oversees the technical operations of Results Radio, a twelve-station chain in Northern California.
. . . Looks like you could use some rear end work . . .
Michelle Ross plays R&B, Disco and Funk on KSFX-FM in San Francisco, probably on September 7, 1978. Ross is a classy host who even corrects Barry White on his grammar in a backsell. Rosie Allen presents a feature about bargains. Yes, the music is played in "sets" and for the most part, you'll hear the records identified after they are played. The old rules of Top 40 have been replaced by the "new" formatics of FM radio, though we do get ONE "layover". Comments on an earlier KSFX exhibit suggest some version of this format continued into the 1980's, when KSFX finally succumbed to the ABC Talkradio feed. In 2015, KSFX-FM is a station in Roswell, New Mexico.
. . . This is NOT a school. I repeat - This is NOT a job . . .
Dana Lauren is real and very pleasant for the few minutes she is allowed to speak (less than 3.5 minutes out of 87..) Dana worked at WHN in New York before moving to Magic 106 (KMGG-FM) in 1982. Those who choose the unscoped version will undoubtedly wonder why a "double golden" (Help and Help Me Rhonda) was included in the second "music sweep" - perhaps this station was subliminally calling for some programming assistance? C'mon, you play two tunes back-to-back that are completely out of context, and your talented and capable host isn't allowed to say anything? Tragic. There are those who believe top 40 started with a jukebox. There's no doubt that it ended that way. All but 3.5 minutes of this one could be broadcast from an I-Pod, and in fact, even that 3.5 minutes could be pre-recorded.
. . . Love is a Battlefield, so make sure you're protected . . .
Hopefully someone can identify the jock who opens this aircheck; we didn't get his name. But most of this exhibit is Dave Murphy on the 9PM Sunday shift at KIIS ('KISS') FM in Los Angeles, probably in late September of 1983. Murphy is another graduate of San Bernadino's KFXM and KMEN who has been successful in L.A. radio. A variety of early '80's hit music (leaning urban) dominates this stereo selection (which sounds SWEET in broadband at 96kbps!) Whether you choose the 'scoped or unscoped version, you'll hear John Houseman (d. 1988) for McDonalds. Houseman helped found The Mercury Theatre with the great Orson Welles. I can't help but wonder how many more Millions Sold were attributed to this campaign. And whose is the smooth ID voice over the Prince record (12:06 unscoped, 1:07 'scoped)? It's nice to hear a strong ID that doesn't growl. It's clean and friendly. Kewl. Finally, an aside to real-time programmers: Please note this successful radio station didn't play hits back to back without an ID (layover, jingle, jock) between or over them. If all your radio station does is play one hit after another, you are not a radio station, you might as well be an MP3 player.
. . . Hey Rob! You're Great, I Love You! Don't ever change - let's have lunch . . .
Lou Simon and Dave Donovan (aka voice-over superstar Joe Cipriano) are heard on this very early unscoped stereo sample of HitRadio KKHR(FM) in Los Angeles, from September 26, 1983. This was the second month of the format, programmed for CBS by Ed Scarborough. Nice jingles, and a sweet touch of 'verb on the mic, too! Between Lou (6-9 AM) and Dave (9A-12N), an energetic Rob Williams is featured with a newscast that includes several very clean clips of U.S. President Ronald Reagan addressing the United Nations.
. . . KISS-FM, What A Dump! . . . Here's another nice slice of KIIS-FM from late September or early October, 1983. Big Ron O'Brien (identified only as "Big Ron") sticks to the basics and slides on through PM drive in stereo. If you're an Eighties fan, the music is a fine CHR blend of pop, rock and dance - variety in review! And KIIS is underway with the Daily Cash Payoff, billed as the biggest daily cash payoff in L.A. history. One Song, One Phone Call, and You're Thousands Of Dollars Richer. Really  there's a promo with a $4000 winner and another $5000 is up for grabs before 8PM. Geesh, how long could they maintain such a tremendously expensive promotion? Great (JAM) jingles, though, (even one for musicradio) and once again, you will NOT hear songs back to back without an ID. Yep, this is what genuine radio sounded like when government regulation forced authentic competition. You had to remind 'em what they were listening to. What a novel concept!
. . . all your favorite music on one station . . . This 'scoped version includes all the missed opportunities for station identification, Ms. Miller and a very light spot load. Carol Miller, interviewed by Forbes magazine for an article titled Come Back, Mr. D.J. in November of 2006, is heard on WPLJ in the summer of 1983. And although Ms. Miller is smooth and professional, the format here was well into the jukebox mentality that has all but eliminated disc jockeys 23 years later. It's an "AOR" approach to Top 40, yielding lots of opportunities for listeners to have no idea what station they're hearing. Anyone can play tunes back to back without saying anything, and it's obvious that this approach assisted competitor Z100.
. . . Hit after hit after hit - the new KCPX 99 . . .
Ron Hart closes out his show and introduces Randy Lundquist in this FM stereo exhibit from (best guess) January, 1984. It's 20 degrees in Salt Lake City and this would be a near-perfect recording except for stereo alignment errors that were very difficult to correct. Like our first KCPX aircheck, we are delighted with the JAM jingles, some of the same as those in use at KKHR in Los Angeles. There's reverb on the mic only, but I consider this a mistake. It should be on the entire program chain if you're gonna use it at all. The jocks apparently have been told to speak briefly - because there is absolutely no idle chatter here. However, the format gets high marks because they identify the station, one way or another, before every song. Ah, those were the days, when the iPod format had not yet become mandatory.
. . . Utah's Number One Hit Music Station . . .
- The Non-Music Elements only. Same high quality stereo without all that music you've heard before. In 1984, this was a great sounding FM CHR station in Salt Lake City Utah! Good Gosh, not only are there jingles, (JAM? ), there's REVERB and hit music - and not ONE record is played back to back without some form of ID. Yes, radio was once more than a jukebox, even in Salt Lake City. There's some contest that's a little complicated for me, I'm not sure if I would win a One Hundred or One Thousand Dollar Bill (though I would be happy with either.) Music mix seems to lean a little male anglo, but that probably fit the market at the time. It's great to hear this wonderful capture of Salt Lake City CHR in 1984!
. . . I went to a drive-in movie, in a cab - cost me $512 . . .
Bobby Ocean is a great friend of REELRADIO, and this wonderful capture of his "fill-in" show from Friday, July 13 1984 on KYUU in San Francisco is a very pleasant surprise. LISTEN! JINGLES into HIT songs with a very hip and very friendly Bobby to connect it all. Did NBC own KYUU at the time? Later, 99.7 tried again as KXXX, KFRC-FM and with the debut of this exhibit, is now KMVQ. Bobby worked as weekend and fill-in at KYUU in 1984, so maybe he had license to sound so casual. It is truly amusing. Bobby is so cool.
. . . if a mistake is ever made, we have our official NBC Scapegoat, Sally, our lady of perpetual sorrow . . .
Bobby Ocean's otherwise perfect and professional performance is sabotaged by a defective tape device in Part Two of this KYUU radio show from July 13, 1984. Bobby takes it all in stride with good humor and a determination to obtain an "official" apology as quickly as possible. Flash forward 28 years: When the computer stops working, pretty much everything is broken. But that comfortable old-time technology allowed many more things to go wrong. How much do we miss tape carts, really? Nevertheless, this particular incident is terribly amusing, and when Bobby tries again, dead air says quite a bit. Wouldn't you think NBC would have had better-maintained tapes and machines? I love the way Bobby turns a technical difficulty into a gag, and an opportunity for fun  Instant Replay and all!
. . . We havin' fun now? . . . In January 1982, KLRZ-FM moved to from Provo to Salt Lake City as Color Radio. On February 8, 1985, they announced their new format as Z-95, and this aircheck was made shortly thereafter. This exhibit is an edited mix of two sides of a 90 minute cassette. Three songs and a couple of commercial announcements were removed. The late Jay Stone was top-drawer talent, and here he is in PM drive, but maybe not as happy as he would like to be. There is one embarrasing moment of DEAD AIR, about which Jay quips, "I love those short naps". Could have been a technical issue, or operator error. It would have been nice to hear more of Jay, but this was 1985, and the iPod format was everywhere. There are lots of music-to-music segues, but at least, a few infrequently "whispered" IDs. REELRADIO contributor Eric Rhoads owned KLRZ-FM at this time.
. . . you know, I think we can probably do that for you, Mom . . .
KKRZ was originally KGW-FM in 1952, went through a few changes and eventually became CHR-formatted Z-100 in 1984. Sean Lynch has a great voice presence here as midday host in July, 1985. He became KKRZ Program Director in 1986, and a voice-for-hire in later years. Contributor Mike Miles made nearly all of his recordings from a moving vehicle. KKRZ moved their transmitter location in the years that followed this recording, but in 1985, coverage was a little spotty. As a result, this otherwise very nice-sounding recording becomes grungy and noisy a few times, as is the nature of FM multiplex in fringe areas. There's a tune by local favorite Jack Charles, notable first-tier commercial production, and this station was typical of good medium and larger market stations in 1985. They still had a "live" air staff and jingles, plus some great "imaging", as the kids call it. No music-to-music segues here - this station was holding on to a "sense of show", some community identity, and a healthy spot load.
. . . dropping from number 12 last week - the New Edition . . .
Wowsers! This one has many of the classic "Top 40" elements - it includes part of a countdown, it has a live host, some sort of ID before and after EVERY record, cool jingles, promotional activity in the service area, great records that stiffed, bad records that were hits, even reverb (if only on the mic!)  and over-the-top audio processing. Someone loved putting this station together, it's a tight, clean presentation, even if the recording is a little fuzzy. And T.J. Evans is just the jock to make it work - not too friendly, but nearly flawless, quick and professional all the way.
. . . Variety Makes The Difference . . .
Oh My. In light of the controversy over Janet Jackson and the 2004 Superbowl, this unscoped aircheck of Leslie Stovall on KMEL in the Electric 80's is somewhat confusing. You'll hear Ms. Jackson claim that Nasty, Nasty Boys - don't mean a thing. But then again, there's no Justin Timberlake malfunction here. Those who make a nice living programming an "80's Format" should get all tingly over this one. It's mostly music, and that's why we have provided a scoped version of this aircheck, just for you. By 1986, radio stations were becoming jukeboxes, like just most popular music stations of today. In 1986, there were more commercial sets, but they were shorter. By the way, playing two tunes back to back without any ID (creative, entertaining, or otherwise) is just plain boring. At least this station had some nice jingles.
. . . San Diego, America's Finest City . . .
How great to hear genuine, mass-appeal, hit-music radio on B-100 (KFMB-FM) in San Diego! It's late Summer, 1986 - the Lionel Richie concert has been delayed a day, The Monkees are appearing after the Padres game, and it is America's Finest City week, after all. According to the official Records of the City of San Diego, that was August 16 - August 25, 1986. Yeah, that's more than a week but I'm sure they feel good about it. Both the unscoped and 'scoped version of this exhibit include a fresh, unscripted exchange between Romero and Ellen Thomas near the conclusion. It's just some of that "Human Interaction" that used to occur when Humans were actually at the radio stations on which they were broadcasting.
. . . It's a pretty good size party here this morning . . .
Bruce Kelly & Company and Alice Cooper are featured on KZZP, Mesa/Phoenix, on a hot summer morning in Arizona. You can tell this is 1986 FM CHR, because underwear is discussed within the first minute and they managed to work in "vomit" in just under 1:17. They are remote, "on location", in the home of a listener who won a "Home Entertainment System". (Sounds like "Wierer" or "Werez" .. ?) The theatrics by Cooper and Mama, involving rattlesnake heads and weeds, were undoubtedly for the MTV coverage. I hope. And what is that awesome TV-Themed sampled synthetic dance record (starts at 13:27) that's followed with Kelly's reference to Wallace and Ladmo? And what about this Iceman dude? Did Kelly & Company have a resident crooner with a keyboard? And certainly, The Hooded Hangman must have gone on to greater accomplishments. There's about 10 minutes missing between 7AM and 7:12AM, but that's the only edit in this otherwise unscoped (music intact) recording which begins around 6:50 AM and concludes around 7:45AM. I know nothing of what happened to any of the players (other than Alice Cooper), and your informed COMMENTS are welcome. But I must add that it's always impressive when a local radio station takes the show on the road. This is what local media does best, and only local media can do it. That's what makes this aircheck fascinating and one-of-a-kind.
. . . Tina Turner is back with 'Typical Male', let's see, three bills, four flyers, a letter from my mother saying what are you doing working for KIIS-FM? Hey Ma, I dunno! . . . This exhibit was recorded from a moving vehicle, so it is scratchy and fuzzy in some places. The 'scoped version is highly recommended because there IS something between every tune. Yay! It's more than an iPod, it's a show, y'know. And in 1986, it was still radio, though the size of the stopsets matched those of man-size Big Ron O'Brien, according to Cheryl of Klymaxx. Our 'scoped version includes some notable spots: We Got The Juice .. whatever happened to that? Google it, it's all over the place, but nothing about "Apple Slice". Wierd. You'll also hear the Great One, the late Jackie Gleason for MasterCard, and a clever spot for Disneyland.
. . . and do you know if she has any animals, and a car registration . . .
Frank Murphy pulls parking lot duty on a Free Money Thursday with WAVA Morning Zoo dudes Don Geronimo and Mike O'Meara. This unscoped, stereo aircheck from June 25, 1987 has some fading, but for the most part, the fidelity is excellent. Don and Mike take to the phones with What's Your Nag and a listener reads a letter from a local newspaper calling them "halfwits". They try, but are unable to speak with John Hinckley at St. Elizabeth's Hospital. David David Haynes is heard with two newscasts  Jackie Gleason died the day before, and Washington, D.C. had the highest food costs in the nation.
. . . I was thinkin' this year, we could get Menudo for the 4th of July - that would be spankin'! . . . Here's Flash with just the one stop set, little bits of the music and a promo at the end. Flash Phillips sure sounds genuine here. And he's not that Phlash person, either, who works in Satellite radio. Flash is terrific, but the station formatting falls a bit short. No jingles, first of all... c'mon! WAVA was a modern miracle - a Top 40 station on FM in stereo with REVERB! - still kickin' it in 1987 (and in one of the most "Urban" areas in the country...) In 44 minutes, there is ONE stopset - 3.5 minutes (but 4 units!) plus sweep intro. There's also a killer promo at the end, but you should NEVER play a promo into a commercial set. But they did. This is one of the reasons why they aren't around to give me (or you) a job today. Sadly AND furthermore: there are TWO of those bothersome music to music things with NO ID. (sigh.) How do people know where they heard the music unless you tell them?
. . . Continuous Music (Continuous Music) . . .
Not much here, unless you like the music. Linda Kelly has two talk sets for a total of 40 seconds in this entire 46-minute recording of The NEW WPGC NINETY FIVE in Washington, D.C., most likely from June or July in the Summer of '87. Some guy named Al (?) gets one set opening this exhibit. There's a single stopset (at about the 30-minute mark) SIX units and SIX minutes and ten seconds (including a station promo), clearly demonstrating the programming philosophy that has continued to redefine "music radio" simply as "music." The "formatics" of this (the iPod format) haven't changed since 1987. A 16-year old then is 38 in 2008, and part of the Big Money Demo. They've been trained to believe there are two kinds of radio - talk, or music. Truly, the Radio Disc Jockey was already history in 1987.
. . . the dwarfs just threw Snow White into the hot tub . . .
Breakfast Flakes Randy McDaniel and Tom Collins are heard in the 7AM hour on Hit 100 (KGGG-FM) in Rapid City, South Dakota. This all-too-brief aircheck was recorded on June 17, 1987, and Collins does triple-duty as backup-flake, Sports and News guy. The first two bits are very entertaining - the Flakes place to a call to Garfield, and the hilarious Spam Dis-So-Lay spoof might be the work of the American Comedy Network. Note also the very high percentage of local spots voiced by the Flakes - genuine local morning radio, and excellent fidelity, too!
. . . gonna play this next tune for everybody's that gridlocked on the San Diego Freeway - little bit loco, but you got no motion, I know . . . Here's The Gunner with just the one stop set, little bits of the music, traffic, sports and a couple of promos. With the debut of this exhibit in October of 2005, it's a keen reminder that a bunch of '50's and '60's oldies that the big groups will not touch today were considered just fine sixteen short years ago. Your New Oldies Station, KODJ (93.1) in Los Angeles (previously KNX-FM, KKHR-FM and eventually, KCBS-FM) had a big, deep playlist. And even better, they had a tight, brightly processed Top-40 presentation with hot jingles, great promos, properly placed ballsy imaging (who was that guy?) and exceptional air talent, like Machine Gun Kelly. He's featured here on the afternoon of the re-scheduled third game of the 1989 World Series. There's much more to be written about this exhibit from those who remember. And, a couple of those Gunner segues are really quite remarkable: Young Love to I Remember You, fr'instance.
. . . Less talk, more music . . .
Less talk, more music? No foolin'! Out of the 46 minutes recorded, less than two minutes was something other than music. There are lots of Scott Shannon's recorded production elements to accompany this pre-iPod hard rock format, but Whitney Allen only appears twice for a total of 22 seconds! Could this format have been automated? Today, sure. Then, the technology wasn't ready. And it's a shame we don't get to hear more of Allen. What we do hear sounds great! Whitney worked in San Diego for 5 years before getting the call to help Shannon put his new Pirate Radio format on the air in L.A. A couple of years at the Pirate, and she was off to KIIS until 1995 when she moved to KZLA and then into the syndicated After Midnite. By 2000, she was working at a suburban L.A. station.
. . . This job tires me out! . . .
Rich Fields is heard filling in for Machine Gun Kelly, and he's playing Oldies, Top-40 style, on KODJ-FM. Best guess on the date: June, 1990. Rich Fields, 2006 Kelly O'Connell. According to Don Barrett's L.A. Radio People, they both apparently ended their Los Angeles radio careers at 93FM. Fields went on to several radio gigs in Tampa-St. Petersburg Florida before he returned to CBS in L.A. as weatherman for Channel 2 in 2003. (How appropriate that this aircheck features him poking fun at "big weather ratings"!) In 2004, he was selected to replace the late Rod Roddy as the announcer on The Price Is Right, TV's longest-running game show. Fields is an Emmy Award winner.
. . . Just heard from Gary in North Hollywood . . .
Jill Angel, 1997 This CBS Radio station has reverb, jingles and the 1988 Toughest Cop Alive (female), Jill Angel, with Good Times and Great Oldies, sometime in 1990. 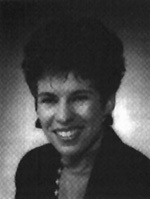 Jill also worked with KNX, and joined the California Highway Patrol in 1983. Like all of Mike Miles' contributions, this was recorded from a moving vehicle, so there are fuzzy dropouts from time to time. It's pretty rough up front, but settles down as it goes on. This station played some really old oldies! With publication of this exhibit in 2017, we know only that Ms. Angel was working in the Health and Safety section of the CHP, in Sacramento in 1997.
. . . The Innovator. Not the Imitator . . .
Chet Buchanan is exceptional as the midday guy on this Phoenix suburban CHR with lots of soccer moms (and their daughters) - and it's 1991! Not only is there an ID or more between every song, there are promo-jingle hybrids *between* spots on this station! The Mike Miles Collection was Established October 5, 2003!